It is Santa's policy to not only respect and protect the safety and privacy of visitors to emailSanta.com, but, when able and appropriate, to take action to safeguard their well-being. Beside Santa and the Head Elf, a focus group of parents, child psychologists, lawyers, translators and several of Santa's "regional representatives" have all helped to create this site (even Santa has to practice those new-fangled management techniques nowadays!). Santa would like parents (& kidlets too!) to know that no personal information from the emailSanta.com site is sold or otherwise provided to anyone else with one key privacy exception). As a safety measure, the information requested in children's letters to Santa is kept to the minimum that Santa needs to check against his "naughty & nice list" (*wink*) and to give a reasonably intelligent, personal response. For example, there is no "registration" process. Last names, street addresses and telephone numbers are *not* requested and, indeed, are actively discouraged. Including an email address is completely optional). As well, Santa strongly recommends that kids check with an adult first before giving out *any* information on *any* website, including emailSanta.com. To receive a reply from Santa, the following fields must be completed by visitors: first name, age, gender, city, region, country, and three Christmas wishes. Additional comments to Santa are optional. Santa receives many of these wonderful comments and likes to spread the Christmas spirit by sharing the very best of them with others. Permission to share these optional comments is purposely defaulted to "No" to prevent accidental permission and a link to other shared comments is provided to help the visitor decide if they wish to share their comments. Even if permission is granted, any potentially personally identifiable information is edited out before a comment is shared. 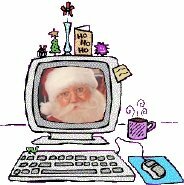 All servers on the Internet, including emailSanta.com's, receive information about visitors. Specifically, server log files contain the following fields: Host (visitors' IP address), Identification (normally a hyphen), Authentication (again, normally a hyphen), Time Stamp (when a file was accessed), HTTP Request (name of the file requested), Status Code (whether the file was transferred correctly), Transfer Volume (number of data bytes actually transferred), Referrer (page from which the user clicked), and Agent (name and version of the visitor's browser). The elves use software to aggregate and analyze this information to maintain and improve the emailSanta.com site. No personal information is used in this process. Also, "cookies" are *not* used in the emailSanta.com website -- mainly because Santa would just end up eating them anyway (*wink*). Starting in 2015, emailSanta.com uses non-specific geo-location cookies to improve the user experience. However, a pop-up window appears asking if you approve of this first. ("Cookies" are files containing information that a website stores on your computer). Santa may not (and does not) require a child to disclose more information than is reasonably necessary to participate in an activity as a condition of participation. The U.S. Government's "Children's Online Privacy Protection Act" (COPPA) requires "That the parent can review the child's personal information, ask to have it deleted and refuse to allow any further collection or use of the child's information." Please send an email to the for assistance in this regard. However, for the personal safety of visitors to the site (as discussed above), Santa reserves the right to NOT release and/or delete details of a child's letter even where such a letter can be identified and the requestor can prove their relationship to the child. 15 Royal Oak View N.W. PLEASE NOTE: Christmas wish lists cannot be forwarded to Santa for reply from this address, but you can still send an email to Santa by clicking here.